Yet the uniqueness of each individual product formulation, Usually means that no two blending processes are ever the same. From the basic blending of two similar materials to the blending of many Different ingredients with different characteristics, today’s mixers have a wide Variety of possible applications. Although mixing and blending technology has greatly improved over the years. And many blenders are now capable of mixing of all kinds of powders, the Processes of selecting the best blender and the correct overall system design of specific application, still remains an art form because of many Variables. In today’s “Lean Manufacturing ” environment, it is more critical than ever That careful consideration is given to blend times, equipment flexibility, Product segregation i.e demixing of the blended product in post blending. 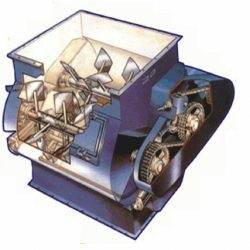 Toshniwal offers new generation powder mixer wherein you get a homogeneous mix in a very short time (30-60 seconds) for dry powder. Facility is available for spraying liquid for uniform coating on powder/pellets as well as lump breaker.